Registered Office: Room L4, Business Centre, Scrabster, Thurso, Caithness, KW14 7UJ. After 16 years as Coordinator/Scheme Manager, Mrs Margaret Page – “Maggie” to hundreds of carers over the years - resigned in August 2004, to resume her nursing training at Stirling University. Maggie was appointed Coordinator when Crossroads (Caithness) was formed in 1988. At that time she worked part-time from her living room, organising the four part-time Care Attendants - two of whom are still with the Scheme. The Scheme has grown over the 16 years to what it is today – a mini-business – still managed by volunteers, but subject to service level contracts, loaded down with statutory legislation and increasing insurance requirements. This is clearly demonstrated by the increase in expenditure in insurance, affiliation fees and the Care Commission Registration up from £1,500 in 2000/01 to almost £4,000 in the past year. Perhaps Maggie saw this increasing admin/finance/legislation aspect in the care field and felt she really wanted to concentrate on care. The Management Committee was aware of the increasing amount of paperwork and took the opportunity, following Maggie’s decision to resign, to reorganise the day-to-day management of the Scheme. Mrs Susan Mileham, a very experienced manager in the Social Services field, was appointed Care Manager to concentrate on delivering carer support. Mrs Erinn MacKay was appointed Office Manager, responsible for administration, finance and the increasing demand for statistical returns. The new structure, with both posts answering to the Management Committee, has provided, I believe, a better distribution of tasks. It allows the Care Manager to get on with organising and delivering a quality carer support service, which is what Crossroads is all about! – not filling in forms. Our application (two 21 page documents) to the Care Commission to register as a care delivery organisation – a statutory requirement - was approved in January 2005 on the payment of £2,000 made in July 2004. The annual renewal/inspection fee of £1,400 – the proceeds of four to five coffee mornings – will also have to be paid before any carer support is delivered. The Scheme’s activities and operation are insured through a policy arranged by Crossroads (Scotland) on behalf of the 50 schemes in Scotland. In an increasingly regulated and litiginous environment, not only has the premium increased by 300%, but the legal demands on the staff and individual members of the Management Committee have increased enormously – to the point where many question whether to continue. Recognising the increasing legislative burden on the Scheme Management Committees and the insurers’ demand for total conformity across the 50 schemes in Scotland, Crossroads (Scotland) has been sounding out the individual schemes on their views on forming one large National Crossroads Charity managed from the centre. 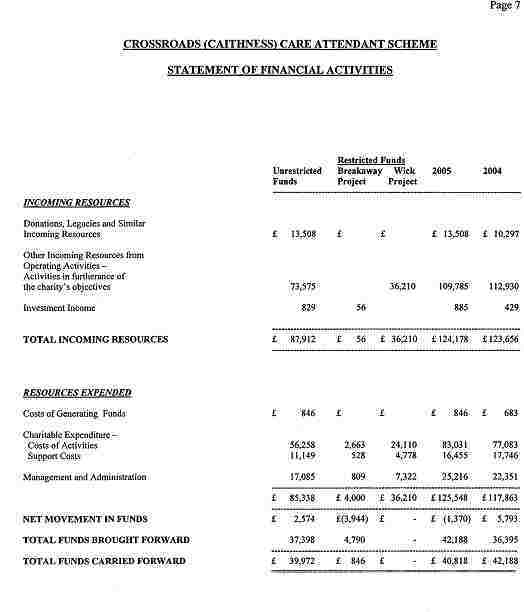 Discussion on this approach will continue in 2005/06 and, if accepted, Crossroads (Caithness) will continue, but the Management Committee would give up its executive role and become more identified with promoting Crossroads and local fund-raising. Carer support in 2004/2005 saw the Scheme register a deficit of £1,370 of expenditure over income – the first time since the Scheme was formed in 1988. This was due to an increase in demand for carer support early in the year which the scheme thought could be met and balanced out over the year. 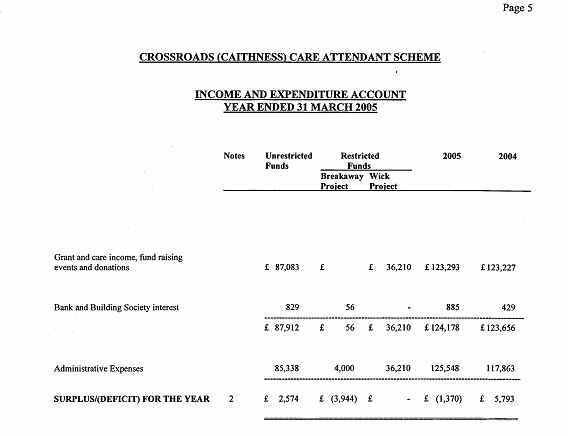 In terms of care hours delivered the financial deficit is some 100 hours over delivered – but that is what Crossroads (Caithness) is all about - spend all the money we get to support the carer. I would like to thank the Management Committee for all their support over the year, but without the dedication, experience and training of the Care Manager, the Office Manager and the Care Attendants there would be no Crossroads in Caithness. Well done to all of them. Directors re-elected at the 6th Annual General Meeting (2004) were Mr Keith Muir, Mrs Eileen Spearing, Mr Gavin Pope. 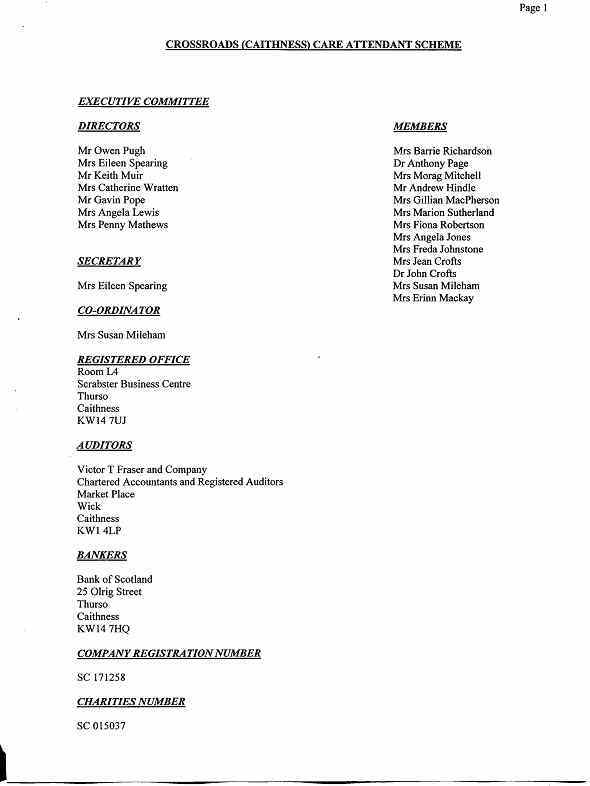 Mrs Penny Mathews resigned as a Director in January 2005 due to moving away from Caithness. The committee were very grateful for all the sterling work she had done as Treasurer. The committee were very pleased to welcome some new, and younger blood, as members in the course of the year – Freda Johnstone, John & Jean Crofts and Angela Jones. As covered in the Chairman’s Report, Mrs Margaret Page resigned after 16 years as Coordinator/Scheme Manager. The opportunity was taken to re-organise the day-to-day management team with the appointment of Mrs Susan Mileham as Care Manager. Appendix 1 shows the members of the Management Committee who served over the year and their attendance at Committee meetings is shown in Appendix 2. The scheme relies on a number of sources of funding to provide support to those caring for others in Caithness. Subject to re-negotiation every year, dependent on the scheme meeting the performance targets. v Purchased Care for Individuals: Area Manager (Caithness & Sutherland) Social Work Services, Independent Living Fund (ILF), and private care. Subject to individual care assessment. Subject to a well argued case put to Trustees by the scheme. Subject to the enthusiasm of the members of the scheme, the Care Manager, Office Manager, Care Attendants, and the support of our carers. The SLA is to provide respite care only to those people whom Social Work Services/Highland Health Board agree should receive support after a full assessment of the carer/client’s needs and resources and allocation of a Social Work identifier. Basically, the scheme is a sub-contractor to SWS under this arrangement. To meet specific/crisis respite carer support situation the local SWS has purchased additional respite care over and above that covered by the SLA. This amounted to 446 hours. The scheme supplied 721 respite care hours requested and purchased by the carer or the person being cared for using allowances from statutory bodies identified for that purpose eg Independent Living Fund (ILF). At present Crossroads does not charge for its carer support. However, should a carer wish to enter into a private contract with the scheme, terms can be arranged. This contract of necessity must reflect the full costs. The scheme supplied 198 hours of privately purchased care in 2004/2005. Lloyds TSB supported the final year of the Wick Project aimed at increasing the “take up” by carers in the east of the county. Over 2000 hours of carer support benefited from this funding. No further financial support was forthcoming for the BreakAway Project from the original sponsors. Applications have been made to the Henry Smith Charity and the Moray Firth Charity to enable the scheme to provide the longer break away from being a carer. No statutory funding can be used for this greatly appreciated break. Mrs Angela Lewis held a Car Boot Sale on behalf of the scheme in Dunnet in May which raised £340 on the day but the money continues to roll in through auctioning the “collectables”. Our Summer Coffee Morning held in Thurso Town Hall in June raised £432. Thanks are extended to all who supported us on the day either by selling tickets, baking for the stall etc or donating raffle prizes. Once again, Management Committee members and Care Attendants sold programmes for the Halkirk Highland Games in July which brought in £840. In November Mrs Freda Johnstone organised a highly successful and most enjoyable concert held in the Thurso High School which raised £887. We are indebted to all the artists who gave freely of their time. Mrs Barrie Richardson organised a very successful Coffee Evening in November in conjunction with the Boys Brigade. This raised £172 for the scheme and £172 for the Boys Brigade. We have been able to hold one extra Coffee Morning this year which was held in January 2005 which brought in £423. In March our Annual Raffle was held raising over £1,180 - our thanks are once more extended to all who sold tickets, all who bought tickets and most importantly to those who donated prizes. Our thanks go to all who helped in fund raising this year and in particular those who always bake for our sales table and those who help on the day..
All events saw a grand total of £5,227 from scheme fund raising. Over the year 74 hours of BreakAway care have been given to carers and clients. This time has been used for a number of purposes, though BreakAways have in general been taken locally to enable carers to have a night out or a longer break from their caring role. The “Breakaway Project” has now exhausted funding provided by Tudor Trust, Camelot Foundation and the Scottish Business Achievements Awards Trust. The Project has provided 1745 hours of longer respite carer breaks, both locally and out of the county since its launch in 1998. This much-appreciated longer break will not be funded by the SWS or HHB and further appeals are being made to major charitable trusts to enable this project to continue. Each care attendant continues to be provided with a mobile phone for use in emergency situations, such as bad weather, vehicle breakdown etc. This project was funded by a grant from SBAAT given in 2000. This project, aimed at increasing the uptake of Crossroads support by carers in the east of the county, has now been completed with the long-term benefit of knowing carers can get support. Over the final year of the project over 2000 hours of carer support benefited from the Lloyds/TSB support. The “Wick Office” in the Caithness Deaf Care premises has now been discontinued. I have worked for 12 years in residential/domiciliary provision with Social Services in Older People Services in Yorkshire. I relocated to Sutherland in 2003 and gained employment with the Highland Council with Older People Services in residential settings. I joined Crossroads (Caithness) in August 2004 as Care Manager where I am developing in my role as my work involves a wider age range and also involves varying physical/mental disabilities. The role is very similar as I am managing a dispersed workforce which brings a lot of challenges. The aim of the scheme continues to be to provide a high quality, flexible, domiciliary respite care service to carers, delivered by a well-trained and dedicated work force. The service offered by the scheme is led by the needs of the carers and clients, but is limited by the amount of funds available. A formal assessment system is used in cases where it is necessary to accord priority for care due to resource limitations. Any person, practice or organisation who wishes to refer a Carer to the scheme for respite care, can see the Client Groups which can be supported and the services which the scheme is able to provide in Appendix 8 and should contact the Care Manager. The Policies and Procedures under which the scheme operates within CROQAS are also shown. The scheme currently employs 20 part-time Care Attendants. Following the resignation of Maggie Page, the opportunity was taken to re-organise the scheme day-to-day management. The post of Admin Assistant was regraded to Office Manager with a rise in hours per week (20 hours) to take on more administrative roles. The Office Manager is now responsible for all bill paying and banking, donations (letters of thanks/receipts), photocopying, filing, timesheet entering, preparation of the payroll and statistics for HC SWS and Crossroads (Scotland) and preparation of invoices, reconciliation of bank statement, and preparation of financial reports to the Chairman, Treasurer and Secretary. Both the Care Manager and Office Manager have a budget and are responsible to the Chairman (Board). The Care Manager post is a salaried position demanding 25 hours/week on a flexible basis. To allow the Care Manager some time to not be on call – two Senior Care Attendants (SCA) were appointed with responsibility, along with the Deputy Coordinator, to be on call during the weekends. The posts have a guaranteed 10 hours employment/week and a £10/day on call allowance. The two SCA posts along with that of Deputy Coordinator are now titled Assistant Care Manager(s) with effect from 1 April 2005. The Assistant Care Manager(s) booked 164 hours in the course of the year. As part of a regular training/supervisory function, care attendants meet with the Care Manager on a regular basis. Care Attendants also maintain contact with the Care Manager by telephone and by visiting the Thurso office. A total of 395 hours were devoted to care attendant training and meetings against 257 hours in 2003/2004. The Care Manager conducted new Care Attendants induction, Food Hygiene and Moving and Handling courses. Caithness (Crossroads) keeps in close touch with other organisations providing carer support, such as the Social Work Services, MacMillan Nursing, Marie Curie as well as other Crossroads Schemes in Scotland. The Care Managers of the 8 Highland Crossroads Schemes meet quarterly and are joined by the Chairpersons twice a year to discuss experiences and innovations in carer support. The Care Manager continues to attend client case conference meetings when invited by the Social Work Services or Health Services. Eleven new SWS referrals were made to the scheme to be funded from the SLA. Appendix 5 shows the client groups within the new referrals. Appendix 6 shows the age of clients supported by the scheme. At the beginning of the year the scheme had 58 carer/clients and ended with 39 clients on the books. 35 carers receive regular respite care hours, the balance being on a flexible basis. There were no accidents or incidents to report. Total respite care hours provided by Care Attendants were 8248 hours against 7963 hours in 2003/04 – an increase of 3.5%. Appendix 7 shows the number of care hours provided by the scheme against the categories. Care Attendants drove 59,075 miles in providing care in 2004/2005 – a new record and an 8% increase on the previous year while the Care Manager and the Assistant Care Managers travelled 2301 miles. The breakout is shown in Appendix 7. 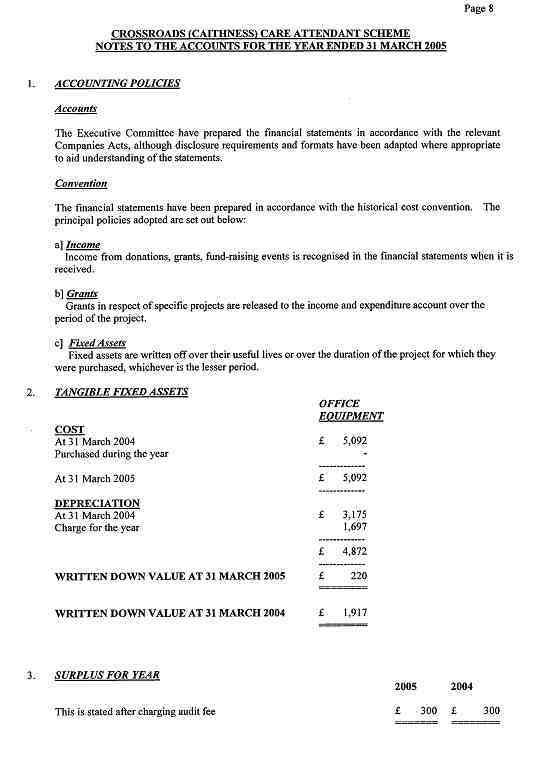 The audited accounts of the scheme for the year to 31 March 2005 are attached as Appendix 9. The Service Level Agreement (SLA) was for £84,070 to provide 5680 hours of respite care. The HC (SWS) in reviewing the scheme’s performance in 2003/2004 judged the scheme had failed to provide 202 hours against the grant for 2003/2004. This was incorrect but an additional 202 hours has been provided out of scheme funds – a subsidy to HC (SWS). The annual October pay review was delayed until April 2005 and brought CA rates equivalent to SWS Home Care rates. The Care Manager and Office Manager were awarded a 3% increase. 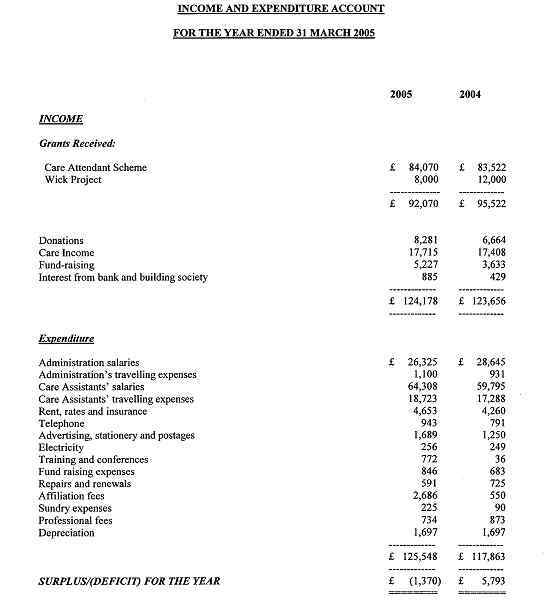 Based on the audited accounts (Appendix 9) the total income was £124,178. 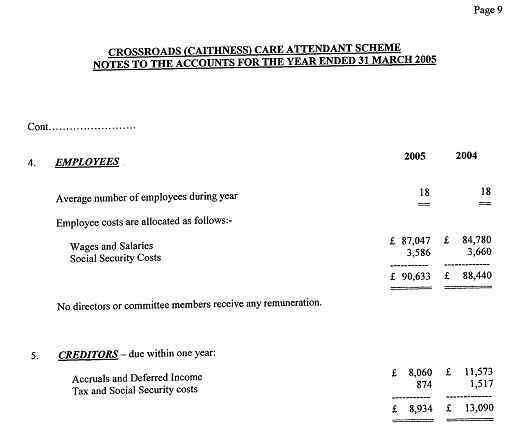 The care attendant wages and travel costs accounted for £83,031. Scheme management and administration accounted for £27,425. Office costs – rent, heat, stationery, lighting, postage, telephone etc with fund raising expenses, insurance, affiliation fees, audit, etc, accounted for £15,092. Scheme expenditure at £125,548 is the highest ever and is to be compared with £117,867 in 2003/2004. The trading deficit of £1,379 is being met by a transfer from reserves. If all expenditure is set against the number of respite hours provided this year this gives a cost per care hour of £15.26. 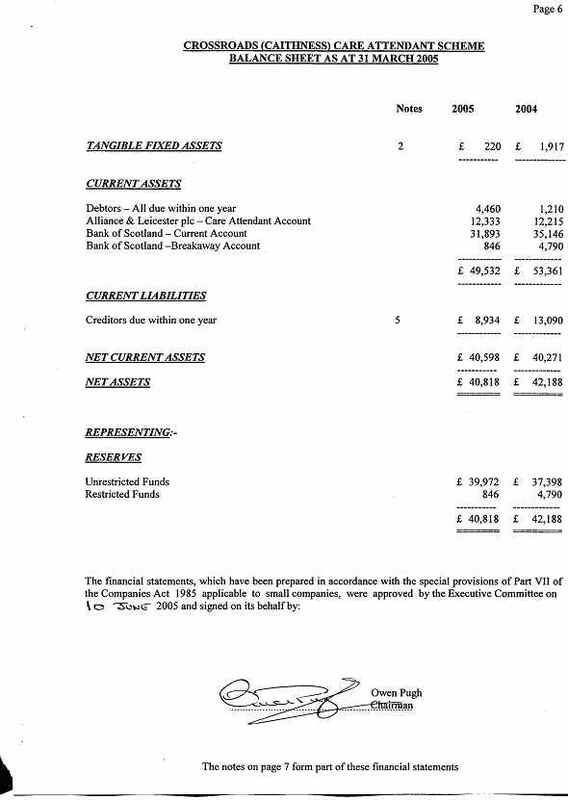 Overall, a satisfactory year, albeit with a small deficit, with our unrestricted reserves standing at £39,977. Restricted reserves identified with the BreakAway Project stand at £846. The unrestricted reserves are necessary to cover any staff redundancies in the event of having to close the scheme (hopefully, a very unlikely event) and also to cover approximately 6 months operating expenditure in accordance with good company practice and to accommodate any late payment of grant money/invoices. While the scheme continues in a sound financial manner, it was necessary, in the course of the year, due to under-recovery of overheads, to keep a close watch on the hours to be delivered. The overall care hour cost rose significantly compared with 2003/04. A close examination of “cost sources” is being undertaken, for while the direct care costs fell, the care management and office overheads increased. There were no Board or Management Committee expenses. Note (1) – includes Parkinsons, Motor Neurone disease, Muscular Dystrophy, Poliomyelitis, Spina Bifida, Cerebral Palsy, and all rheumatic and arthritic conditions, Ankolosing Spondylitis, Osteoporosis, Huntingdon's Chorea, Friedreichs Ataxia, Heart/chest/lung conditions, visual and hearing impairment and Multiple Sclerosis. Note (2) – Includes Epilepsy and brain haemorrhage.